Founded in 1980, Professional Archaeologists of New York City, Inc. (PANYC) is a not-for-profit, all-volunteer organization dedicated to the preservation and protection of New York City's archaeological resources. Its purpose is to promote cooperation and communication among professional archaeologists, advocate for the preservation of archaeological resources with the City's public agencies, and advise and educate the general public on matters relating to the field. 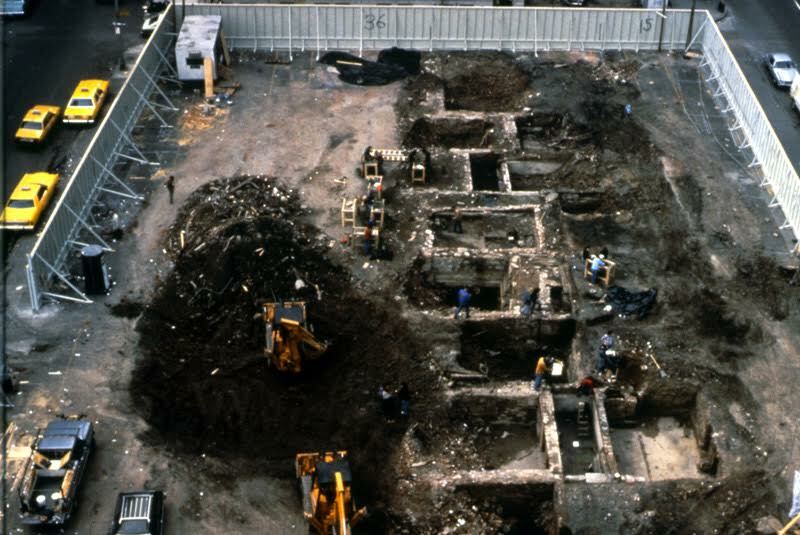 PANYC began in response to the remarkable archaeological discoveries made prior to construction of the new Goldman Sachs headquarters at 85 Broad Street in 1979, the block where the Stadt Huys, New Amsterdam's first town hall, was once located. Concerned archaeologists formed PANYC to ensure that archaeological issues would be addressed at subsequent construction sites as mandated by a new environmental law, the City Environmental Quality Review (CEQR). With the New York City Landmarks Preservation Commission's enforcement of the CEQR process, archaeologists have had the right and ability to excavate dozens of major sites within the city since the Stadt Huys project. Among them are the African Burial Ground, Ellis Island, and Atlantic Terminal Site. You can read more about these projects and the history of PANYC here. it a condition of the developer's permits, led to a spectacular discovery in the landfill: a 100 foot-long ship! Photo credit: Soil Systems, Inc. Membership in PANYC is open to professional archaeologists and graduate students, although anyone can subscribe to the PANYC newsletter. In keeping with its mission, PANYC holds a public event each spring co-sponsored by the Museum of the City of New York. The program provides a platform for professional archaeologists to share their findings and explore the range of archaeological work done in the city with the public. Professional Archaeologists of New York City, Inc. is among the organizations in our roster to use our meeting space. For the full list of groups, please visit our website.